What is commonly called jade is actually one of two minerals. 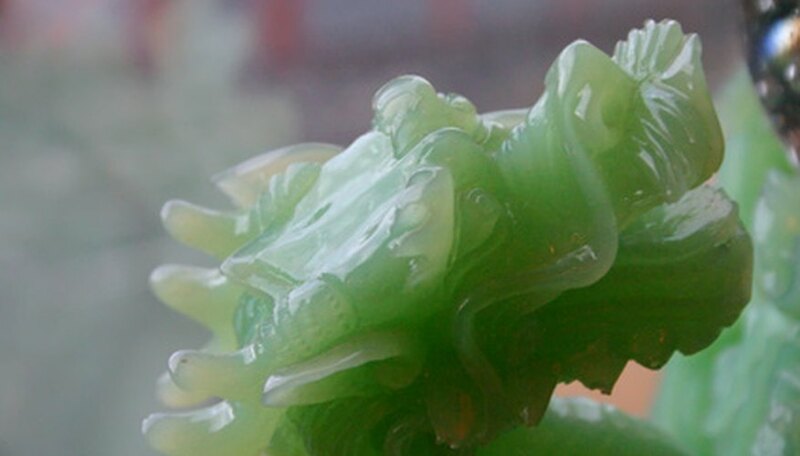 Nephrite is the jade most associated with ancient China. In the 18th century, however, Burmese jade, or jadeite, was introduced into China. Although chemically different, the two forms of jade are formed in very similar ways. To understand how jade is formed, you must first look at the basic structure of the earth. Plate tectonics is the theory that the surface of the earth is made up of a series of plates that float on the Earth's liquid mantle. Plate tectonics explains a number of natural phenomena, like the clustering of volcanoes, the presence of and clustering of earthquake producing faults, or cracks, in the surface of the earth, and the location and height of many of the earth's mountain ranges. Because these plates are floating, they move. In places where plates collide, they create a subduction zone as one plate slides under another. In places where they are pulling apart, deep trenches form, such as the Puerto Rico trench. A subduction zone is where two plates collide. One plate slides under another. The pressure and heat of this process often creates volcanoes. The heat and pressures involved in subduction are also thought responsible for the forming of the two forms of jade. The lower plate carries the chemicals necessary for the formation of jade under the upper plate. The heat and pressure combine to create the structure of jadeite and nephrite. Although they can sometimes be visually similar, the composition and structure of jadeite and nephrite are very different. Nephrite is composed of interwoven mineral fibers. Jadeite is made up of interlocking granules. Nephrite, a form of actinolite, is made up of sodium, calcium, magnesium, titanium, manganese, aluminum, iron, silicon, hydrogen and oxygen. Its chemical formula is Ca2(MgFe)5(OH)2(Si4O11)2. Jadeite is a simpler mineral. It is made up of sodium, aluminum, iron, silicon and oxygen. Its chemical formula is NaAl(SiO3)2. About 45 percent of each is oxygen. Nephrite is found in China, New Zealand, Russia, Guatemala, Switzerland, and in northwestern North America. Although deposits of the dark green North American jade are often called British Columbia jade or Canadian jade, deposits are found in parts of the Cascade mountain range in Washington state. Jadeite is found in China, Russia, Guatemala and Myanmar or Burma. Burmese jade is considered among the finest in the world. Jade is mined as large blocks or natural boulders. Because the outside surface of the jade is relatively nondescript, jade wholesalers take a risk with each block or stone. In some places, such as the Pacific Northwest, jade can be exposed by a combination of earthquakes, land movement and water. Many locals in the Cascades of Washington state, especially around Darrington and the Stillaguamish River, have reported finding jade on above the ground.